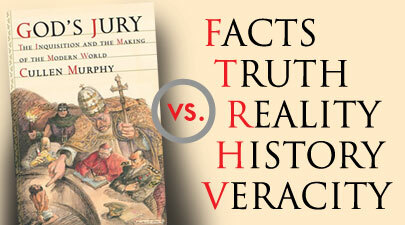 Insight Scoop | The Ignatius Press Blog: Hysterical Anti-Catholic History | A Review of Cullen Murphy's "God's Jury"
Hysterical Anti-Catholic History | A Review of Cullen Murphy's "God's Jury"
Hysterical Anti-Catholic History | A Review of Cullen Murphy's God's Jury by Fr. Brian Van Hove, S.J. God's Jury continues a long and not-so-illustrious tradition of misrepresenting history and attacking the Catholic Church. Anthony Burgess once was reported to have said of himself, “Just because I don’t believe in God, doesn’t mean I am not a Catholic!” While Cullen Murphy, in his latest book, self-presents as someone we might still call a “cultural Catholic” (on page 9: “as a Catholic growing up with many Jesuit friends”; and on page 24: “I began to explore the Inquisition as one who happens to be both a Catholic and an American”; and on page 78: “as a boy growing up in the 1950s and 1960s…I remember references in Catholic liturgy”), possibly his natural intellectual home is with the religiously hostile New Atheists, who include Richard Dawkins, Daniel C. Dennett, Sam Harris, Christopher Hitchens, and Victor J. Stenger, though Murphy does not himself say this. In passing, let us recall that the premier Old Atheist, more informed and articulate than all of the new ones put together, was Anthony Flew (1923‒2010). At last he rejected atheism after a lengthy academic career and much fame. Flew never took interest in Roman law or its offspring, the Inquisitions. His obituary called him “a welcome counterblast to recent antireligious best-sellers.” Among those best-sellers, must we add Murphy’s latest offering, God’s Jury: The Inquisition and the Making of the Modern World? Murphy never claims to be an historian. His edited informal conversations with noted historians (Eamon Duffy, Henry Kamen, Edward Peters, Emmanuel Le Roy Ladurie, Peter Godman, Francisco Bethencourt) are nonetheless impressive. But what is curious is the omission of other serious and relevant historians, including Knights Templar and Joan of Arc-specialist Régine Pernoud, Helen Rawlings, ‘historian-prophet’ Christopher Dawson, Paul F. Grendler, and the distinguished Paul Johnson. They do not merit an entry in the general bibliography. His subject is treated midway in the perplexing landscape between erudite banter and entertainment, with at least one fine exception. The disagreement between Benzion Netanyahu and Henry Kamen over the social causes of the Spanish Inquisition is fittingly presented in “A Clash of Explanations” (pages 94-102). The conclusion of Henry Kamen is that Spanish society was already “curdled” before the Inquisition emerged. Curdled (page 101)!? Without this section and with numerous asides and spurious remarks (and a needlessly ugly dust jacket), Murphy may just remind us of Dan Brown, whose 2003 The Da Vinci Code uses religious themes and historical references to develop a conspiratorial and fictional plot. Brown is mentioned neither in the bibliography nor in the index nor in the acknowledgements, but The Da Vinci Code is referred to by name on page 29. It just seems to me that anti-Catholicism has been so lucrative for so many people that others try to cash in also. People like to read stuff that feeds into their biases and prejudices, regardless of truth. At my age, it still amazes me how many people are willing to sell their souls.